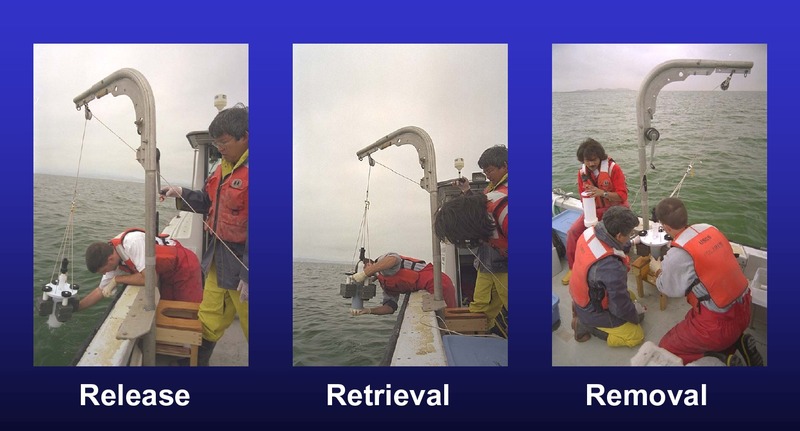 Collecting sediment cores for benthic flux analysis from San Francisco Bay, California. U.S. Geological Survey (USGS) scientists have developed a method for estimating the contribution of contaminated bed sediments in lakes and reservoirs to the overall levels of contamination in water systems. Resource managers in the Nation’s mining-affected areas are faced with difficult challenges, such as what to do about fish contaminated with toxic metals, how to quantify the significance of different sources of metal contamination in watersheds, and how to assess the impacts of remediation and restoration plans. The USGS’s new method gives resource managers information on the rate that nutrients and trace metals, such as methylmercury or nickel, move between the sediments and overlying waters. This rate is known as the benthic flux. The method involves collecting bed sediment cores from the bottom of a body of water, collecting water-quality samples, and conducting laboratory test on the cores. The magnitude and variability of the benthic flux determines whether or not contaminants in the bottom of lakes and reservoirs represent a significant source of those biologically reactive solutes to the environment. Resource managers are tasked with reducing toxic metal contamination in water bodies. USGS studies have shown that remediation efforts to decrease loads of toxic metals from rivers and/or point sources would most likely be compensated initially by increases in the benthic flux of the metals from bed sediments. This is because the management-induced change would result in a greater concentration difference between the contaminant concentration in the water body and within the bed sediments at the sediment-water interface. The potential long-term outlook for these managed water bodies is that concentrations of toxic metals are predicted to decrease slowly after loads from rivers and/or point sources are controlled and contaminated sediment is buried with sediments containing fewer contaminants. Kuwabara, J.S., Alpers, C.N., Marvin-Dipasquale, Topping, B.R., Carter, J.L., Stewart, A.R., Fend, S.V., Parchaso, F., Moon, G.E., and Krabbenhoft, D.P., 2003, Sediment-water Interactions Affecting Dissolved-mercury Distributions in Camp Far West Reservoir, California: U.S. Geological Survey Water-Resources Investigations Report 03-4140, 61 p.
Kuwabara, J.S., Berelson, W.M., Balistrieri, L.S., Woods, P.F., Topping, B.R., Steding, D.J., and Krabbenhoft, D.P., 2000, Benthic flux of metals and nutrients into the water column of Lake Coeur d'Alene, Idaho---Report of an August, 1999, pilot study: U.S. Geological Survey Water-Resources Investigations Report 00-4132, 74 p.
Kuwabara, J.S., Marvin-Dipasquale, M., Praskins, W., Byron, E., Topping, B.R., Carter, J.L., Fend, S.V., Parchaso, F., and Krabbenhoft, D.P., 2002, Flux of dissolved forms of mercury across the sediment-water interface in Lahontan Reservoir, Nevada: U.S. Geological Survey Water-Resources Investigations Report 02-4138, 48 p.
Kuwabara, J.S., Woods, P.F., Berelson, W.M., Balistrieri, L.S., Carter, J.L., Topping, B.R., Fend, S.V., 2003, Importance of sediment-water interactions in Coeur d’Alene Lake, Idaho--Management Implications: Environmental Management, v. 32, no. 3, p. 348-359. Topping, B.R., and Kuwabara, J.S., 2003, Dissolved nickel and benthic flux in south San Francisco Bay--A potential for natural sources to dominate: Bulletin of Environmental Contamination and Toxicology, v. 71, no. 1, p. 46-51, doi:10.1007/s00128-003-0129-7. Topping, B.R., Kuwabara, J.S., Parchaso, F., Hager, S.W., Arnsberg, A.J., and Murphy, F., 2001, Benthic flux of dissolved nickel into the water column of South San Francisco Bay: U.S. Geological Survey Open-File Report 01-89, 50 p.